"Shadow Moon" Eagle Falls- Emerald Bay Lake Tahoe, CA. This is a full moon rising over the Lake Tahoe Basin on May 5th, 2012. 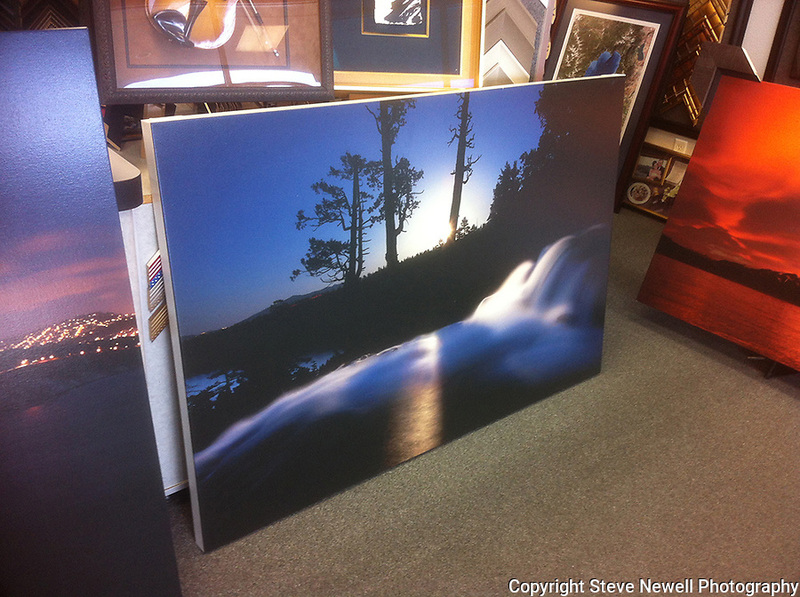 This is a photo of one of my giclee prints on canvas at the frame shop. I specialize in large oversize landscapes. This image was taken at 8:51pm. I used a 30 second exposure, f8.0 aperture, ISO 400, 21mm lens. It was my first time using my Canon 5D Mark ll and I wanted to capture the moon lighting up the basin with the water in motion using a longer exposure. This image has the shadow of the trees casting across the waterfall. On the left side you can see the lights on Kingsbury Grade and a car's light trail through the tree line on Emerald Bay Rd. Shadow Moon is a special moment in time captured at Emerald Bay. The detail of everything stationary is spot on with the waterfall flowing and glowing.